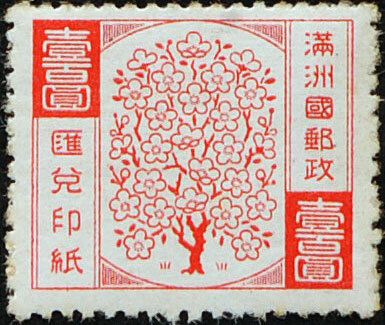 In the 1930's the Post Offices throughout the world played an major role in the transfer of money. 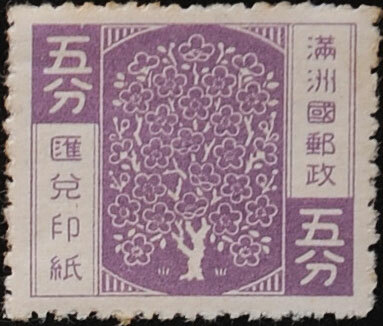 So it was important that money order stamps were available right from the start of the new state of Manchukuo. 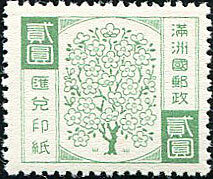 They were, and the stamps went into use from 1st August 1932, the set contains Thirteen values. 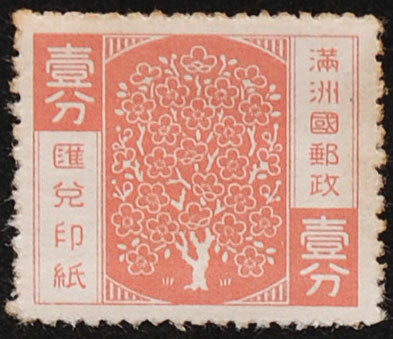 The text reads 滿洲國郵政匯兌印紙 Manchuria Post Exchange Printing Paper followed by the stamp value. Unlike postage stamps these were not sold directly to the public and were strictly controlled by the Post Office and (almost) always destroyed after the money transfer was completed. 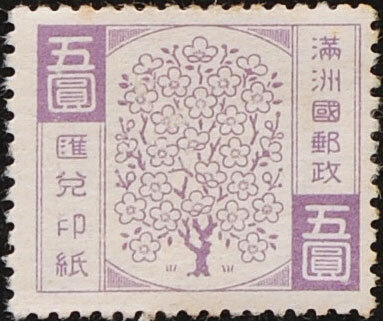 The stamps went out of use in 1934 when a new system of telegraph transfer was introduced, see below. 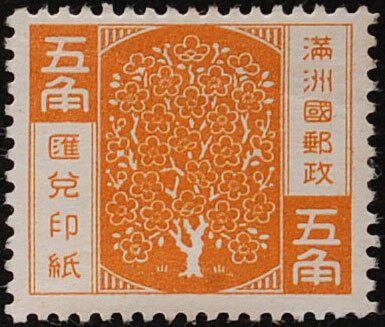 The stamps were lithograph printed on un-watermarked white paper in sheets of 100 by the Japanese Government Printing Office in Tokyo. Designs were probably by Mr Yutaka Yoshida. 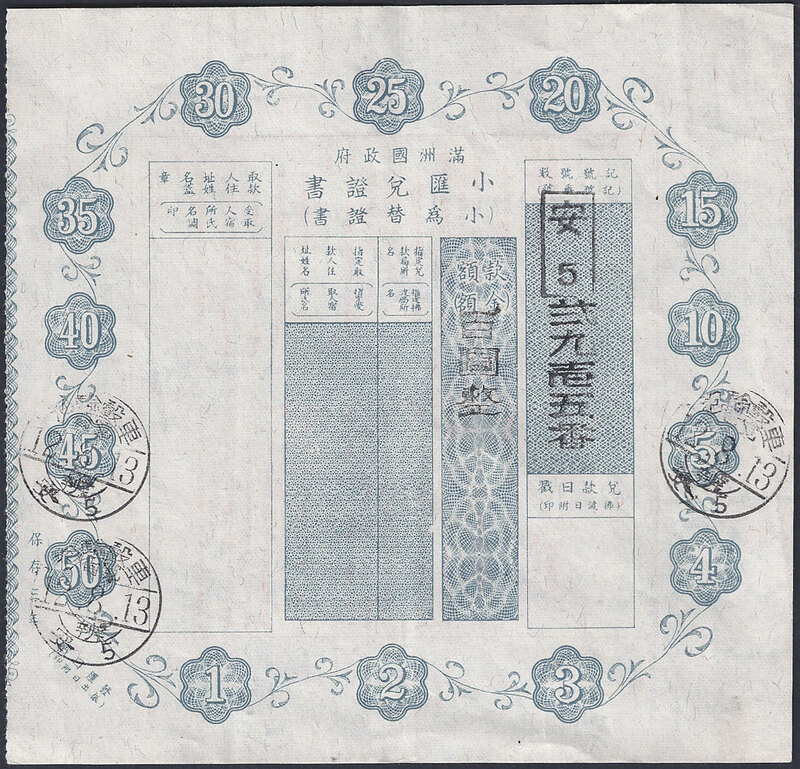 A small number of presentation folders were made entitled Specimens of Manchukuo Postal Service Money Order Stamps, Ministry of Communications, Directorate General of Posts. 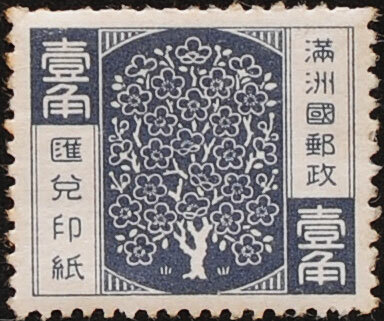 The stamps in the folder were all overprinted 樣本 sample. 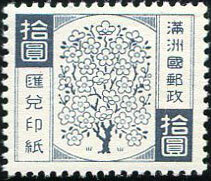 The stamps are 22.5mm x 18.8mm. Perf 13½ x 13. 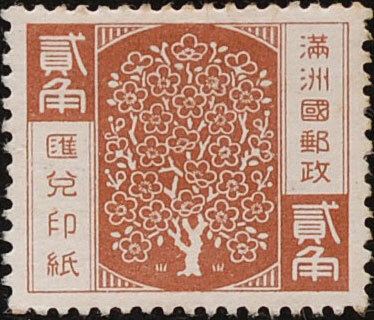 The design of all denominations features a Mulberry Tree, a symbol often used to promote postal savings products in China. 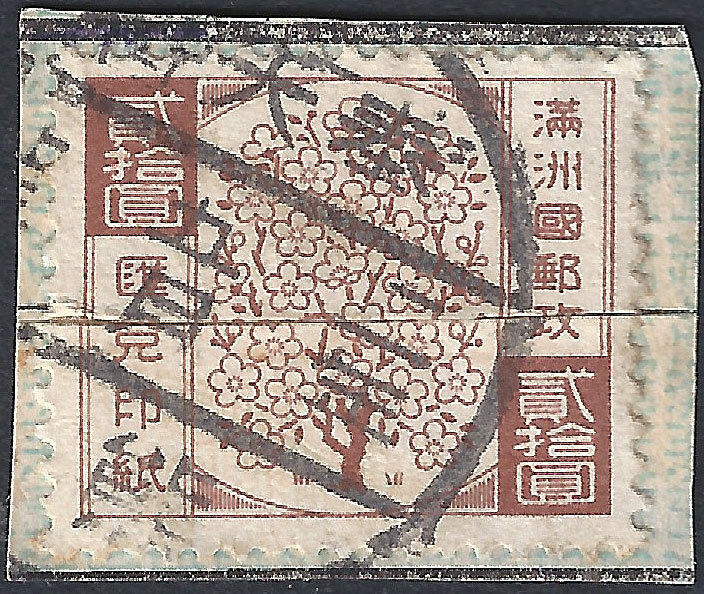 The form used by the Post Office (D-193r) worked on the basis of the form (and the stamps) being cut in half, half for the Post Office to send to the destination, half given to the customer for posting to the recipient. When the recipient went to his local Post Office, providing the two halved matched, the money was paid over and the forms burned to prevent re-use. This explains why both stamps and forms are now very hard to find. 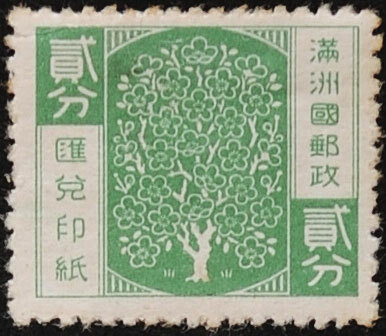 Used examples, these are hard to find as the stamps were usually destroyed after use, the two copies above have been cut horizontally and re-assembled after having been salvaged from a used money order form. 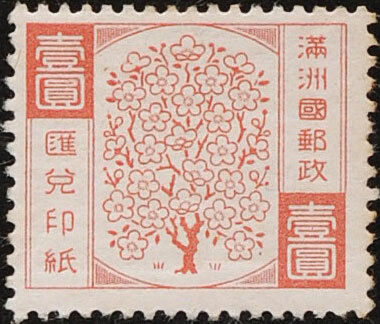 The 5Y stamp shown above seems to have been put to some alternative use. 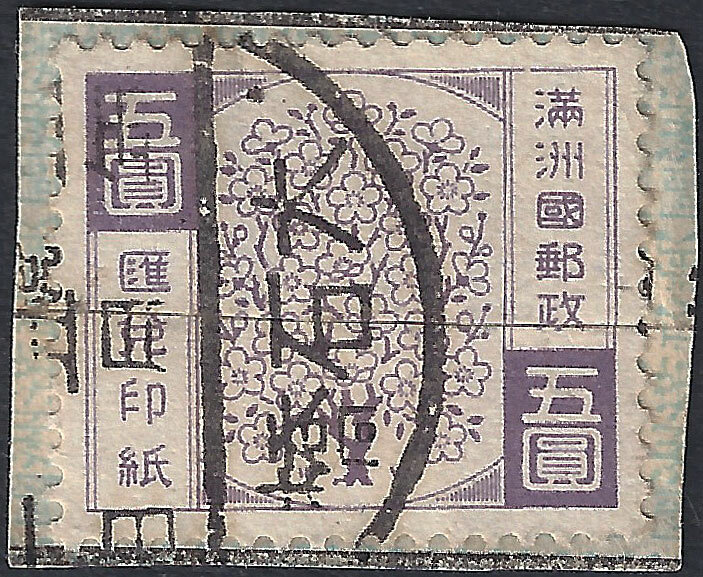 The cancel which reads 國際匯兌股 International Exchange Department seems to be dated 4th March 1937, but it is possible a "3" is missing. 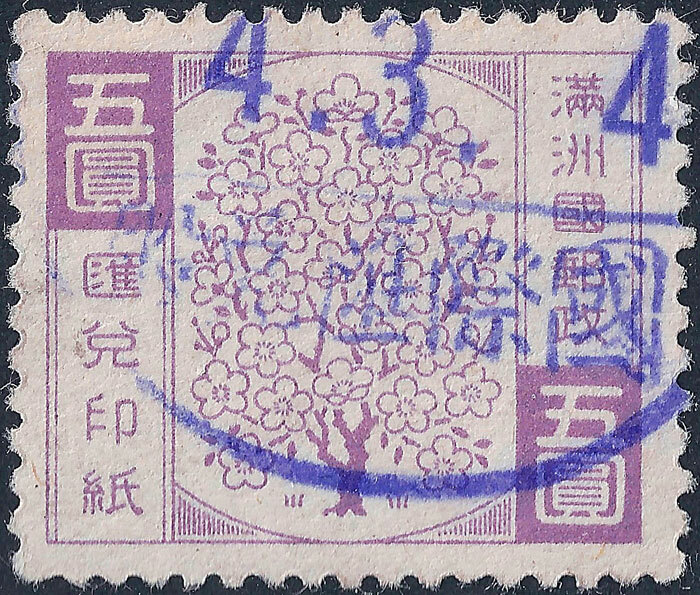 I suspect that it was supposed to read 4.3.34, which would make more sense as the stamps fell out of use in 1934 and the date-stamp, not standard post office issue, was for International use (perhaps to China). 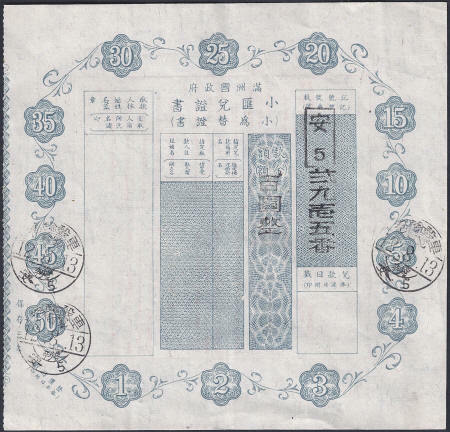 This counterfoil is an example of a telegraph money transfer for the sum of 15 Yuan. 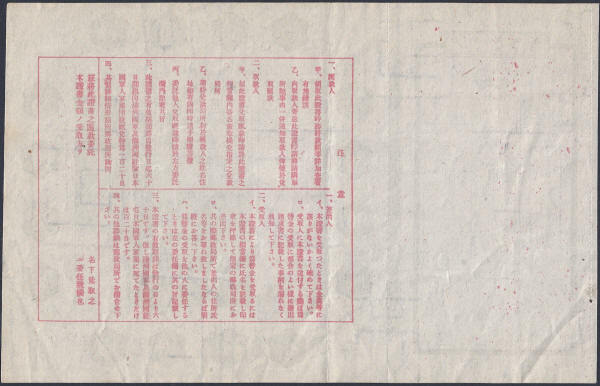 These forms could be used to transmit money within Manchukuo and Japan. The right hand column shows a record number. It is dated 16th May 1938 with an Antung cancel. 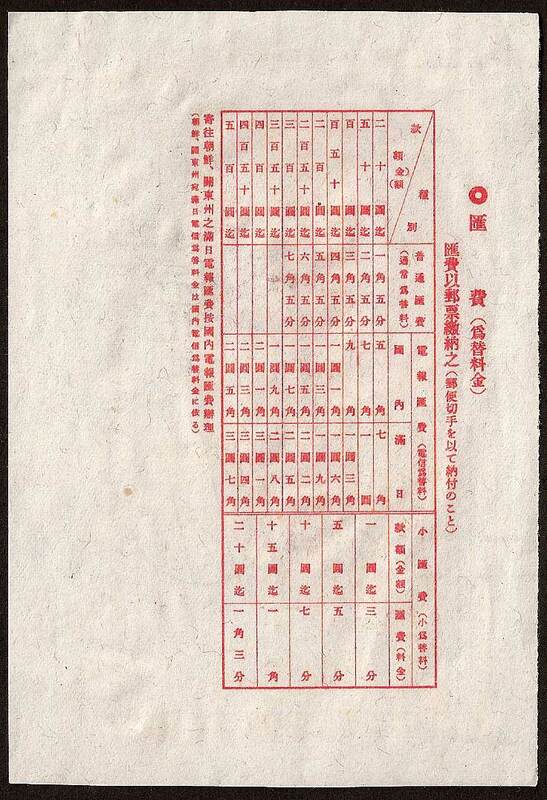 Printed on watermarked granite paper (the watermark being large, widely spaced characters). Size 62mm x 140mm. The reverse side is blank. 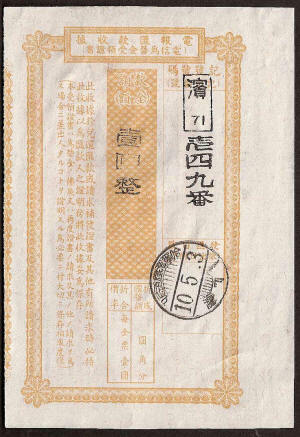 This receipt is an example of a telegraph money transfer. 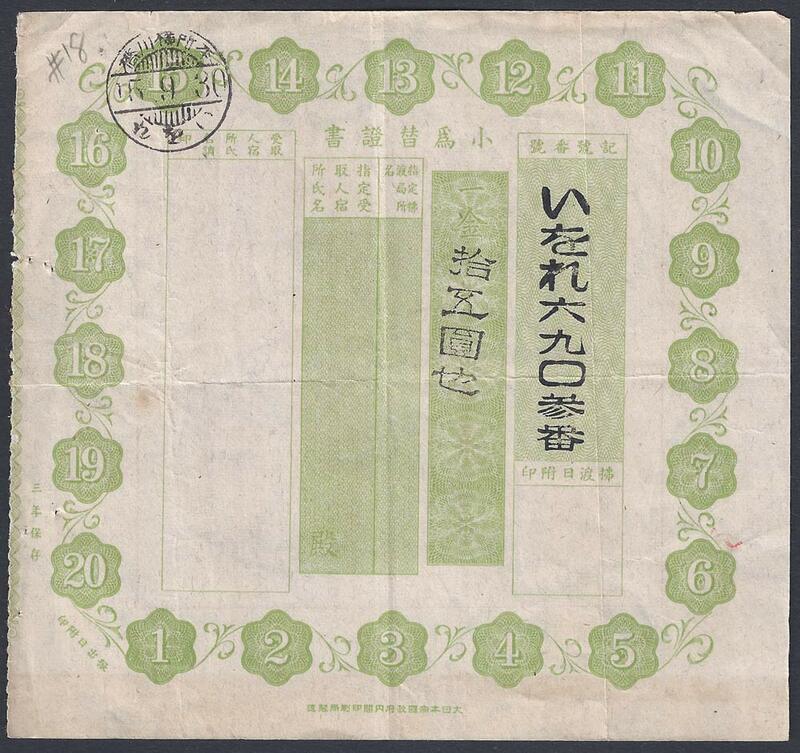 These forms could be used to transmit money within Manchukuo and Japan. 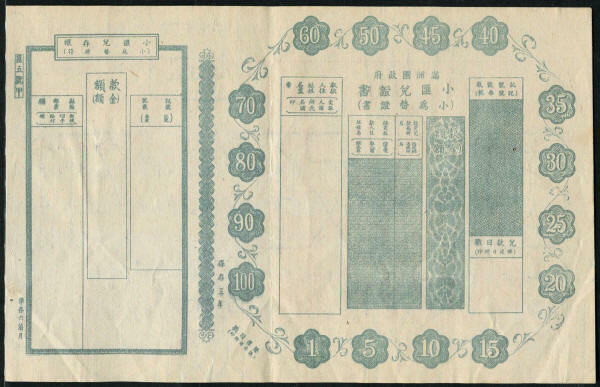 The central column shows the amount of the transfer (1 Yuan) and the right hand column shows a record number. 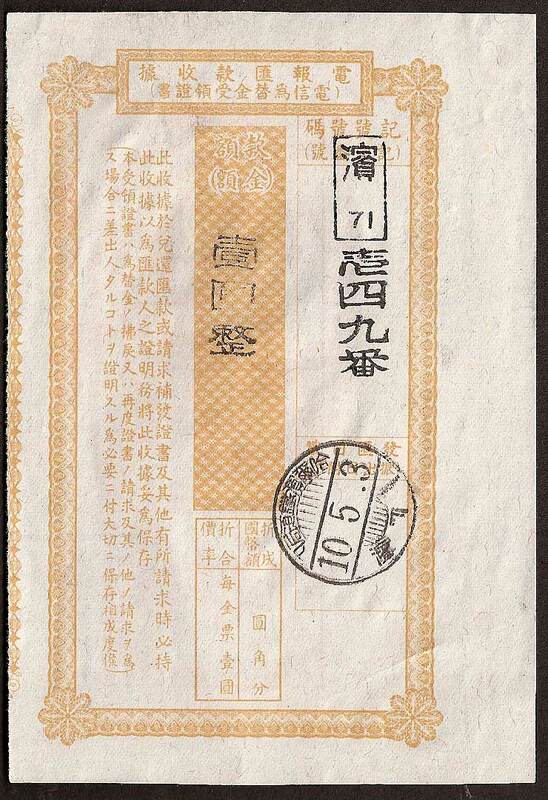 This example is dated 3rd May 1943 with a cancel showing that it was sent from Harbin (Ha Er Bin) Railway Bureau. The table, printed in red on the reverse side, shows the charges for making these transfers based upon the amount of money being sent. 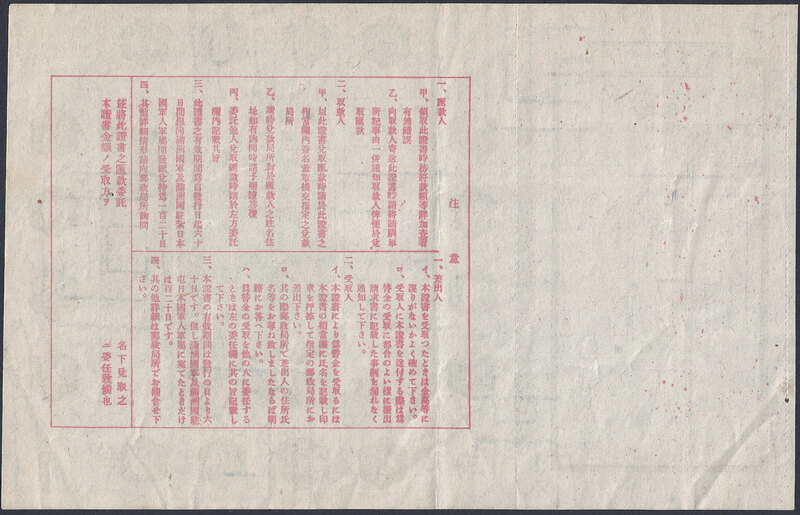 Printed on watermarked granite paper (the watermark being large, widely spaced characters). Size 62mm x 140mm. 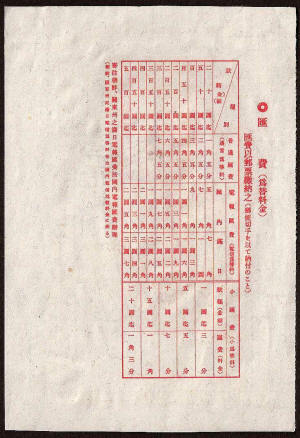 These Manchukoan money orders are based upon a Japanese design - a sample of which (used in Yokokawabashi, a part of Tokyo) can be seen here. The smaller part of the form on the left is the Post Office copy. 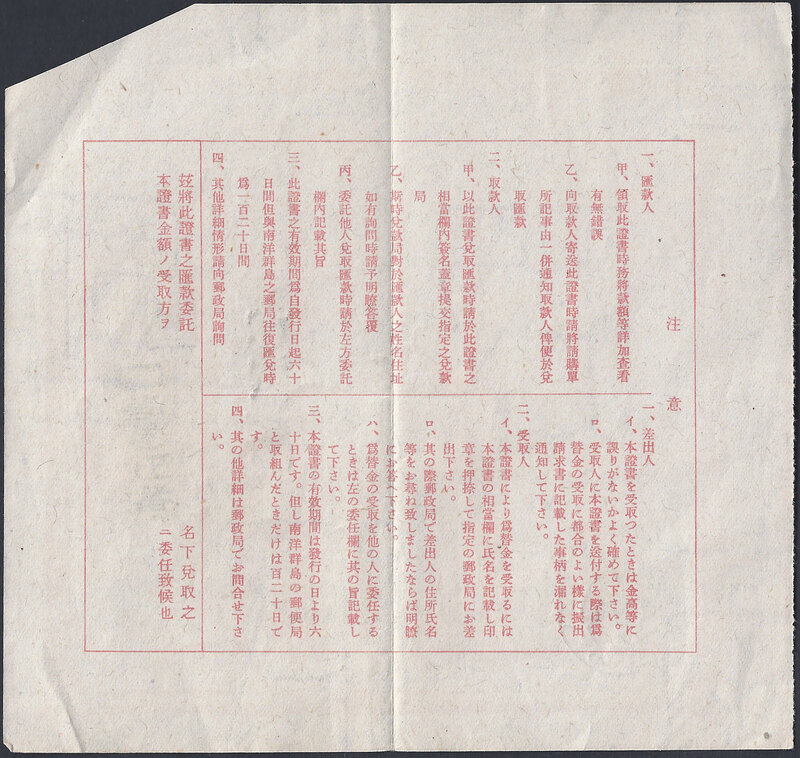 The larger part of the form is issued to the customer and this has clear instructions in Chinese and Japanese printed on the back. Reverse - This has the following instructions for the customer. This is a translation of the Japanese instruction set, (translated by Richard Arent). a. 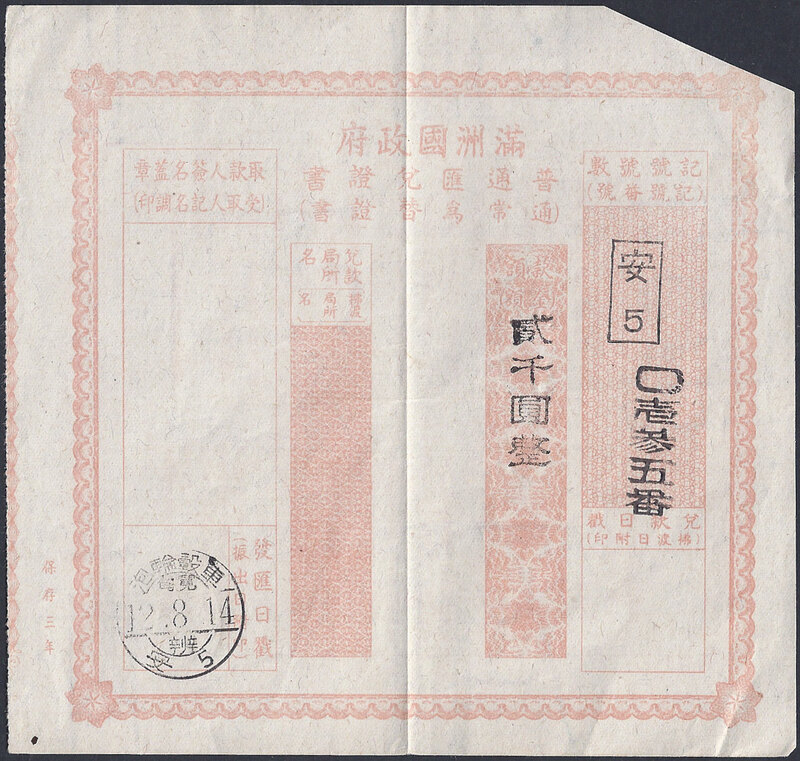 When you accept this certificate please carefully verify the amount of money, etc. so there are no mistakes. b. When receiving this certificate please completely fill in all the recipient’s details. a. 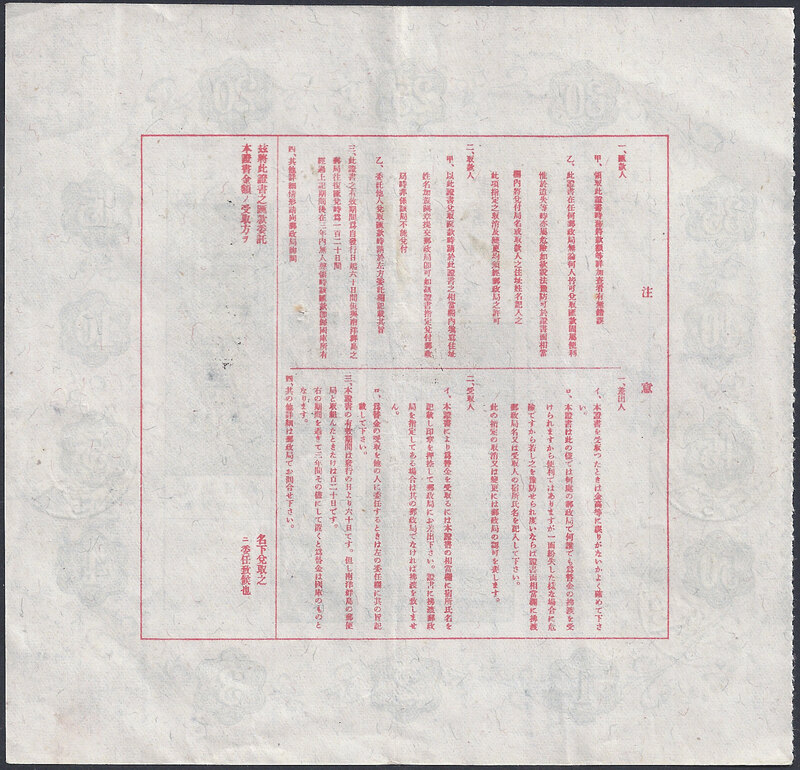 When you receive this money order certificate enter your name and personal seal in the appropriate column and submit to post office or postal agency. b. When at the post office or postal agency please answer clearly when asked the sender’s name and address etc. c. When you want to authorize another person to receive the money please enter the details in the column to the left. 3. This certificate is valid for 60 days from the date issued. However, when addressed to Manchouguo military as well as Japanese military stationed in Manchouguo and civilians employed by the Japanese military in Manchouguo it is valid for 120 days. 4. For further details please inquire at any post office or postal agency. These transfers were made during the August Storm offensive which started on 7th August 1945 and ended when the Japanese surrendered on 2nd September 1945. This must make them some of the last transactions made by the Manchukoan postal service. Click here for side 2.